If you missed it, we are so sorry, it was really a fabulous practice. Make sure you get yourself to the next one! On Saturday 2 July, @TGJ and partners LOOP Theatre are delivered a gorgeous workshop on Integrated Movement Improvisation. A fantastic dive into a partnership with LOOP, and hopefully more to come! Despite the success of the underscore, we have had to cancel our first July jam because we could not find anyone to volunteer. We are so sorry about this. Although we have a had a good response to our appeal, we still need your help donations, commitment to attending the jam, bringing a friend, volunteering, anything in kind … If you can help us, please do. We have started a donors page to thank you. Check our website! We still have a few of our gorgeous @TGJ t-shirts left, in green and aubergine, but only limited sizes of both. Get your orders processed by emailing theglasgowjam@gmail.com. Only £15! Penny is off to teach in Costa Rica and Mexico this summer with support from Creative Scotland, and also to participate in workshops with Nicolas Nunez and Julyen Hamilton. She'll be posting onto our jam blog so you can follow her travels! 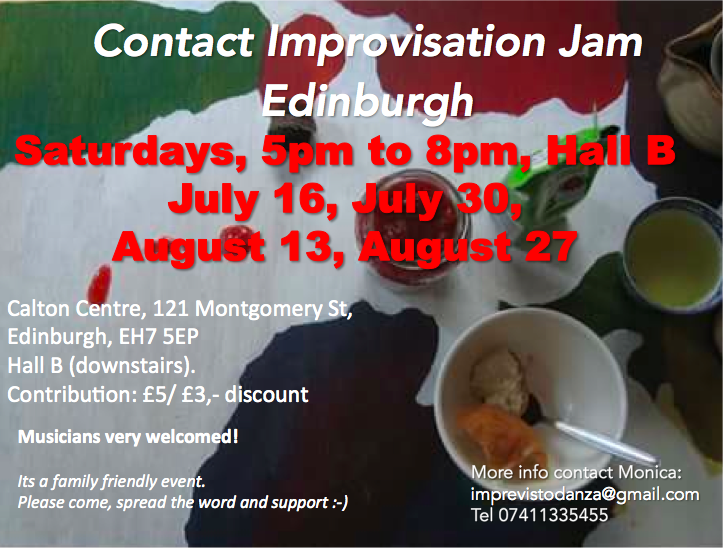 The next jams are listed below (see venues, as we are taking the jam around Glasgow) and, if you need to plan more ahead, we have our full June–December 2016 programme on our website: http://theglasgowjam.blogspot.co.uk/p/jam-calendar.html). See you soon, we hope! It will be 40-50 minutes sharing of an ensemble work (dance and live music) by the group of people, community dancers, very passionate participants of Contact Improvisation & Instant composition classes that I have been running this year.